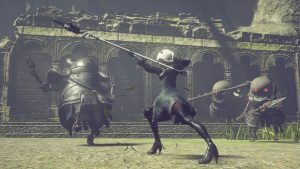 The latest trailer for the action RPG NieR:Automata, called “Arsenal of Elegant Destruction”, not only shows the large variety of weapon types, but also the release dates for the game on PS4 and PC. The trailer, it shows the 4 main weapon types: spears, small and large swords and combat gauntlets. And if that was not enough, you can also have a large variety of attacks to equip to your little side helper, know as the “Pod” support system. NieR: Automata will launch for PC’s on March 10th.